Feel free to skip the logistics, and just contact Julian. He can help you figure out anthing quick as a wink. It's real! This is long exposure photography, not computer graphics. Fun & Fast: People LOVE it! With the simplest setup, the total time is 3 minutes per shoot. Flexible: We can integrate branding, logos, or match any style. Social: We can auto post on social media instantly. Clients: Microsoft, Apache Con, MySQL/Percona, OSCON, O'Reilly, Treasure Island Music Festival, etc. Mind bogglingly cool: People often ask... "How this is possible?"... and... "Did you invented this?" People have a blast and get an incredible keepsake. The photos are each fully unique and get created very quickly. It blew away the judges on America's Got Talent. It will also be thrilling for the people at your event. Fully personal: Unlike a stage performance, each attendee gets a fully personal and often profoundly intriguing experience. Each attendee picks the subject for their photo! For most events, the person being photographed, picks a word. The image created that that subject relates to the word they chose. It's a bit like improv comedy, but with portraits and actual lights. This is part of what makes it so incredible to experience. The pictures are 100% long exposure photography. There are no computer graphics. The shutter is open for less than a minute. Most exposures are about 30 seconds long. In order to light paint, there needs to be a dim environment. 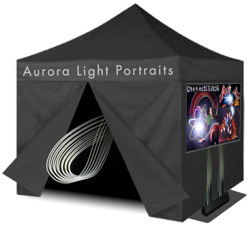 Sometimes no enclosure is needed: If a party is dark enough and we specifically use the brightest light painting tools, a dark enclosure might not be needed. 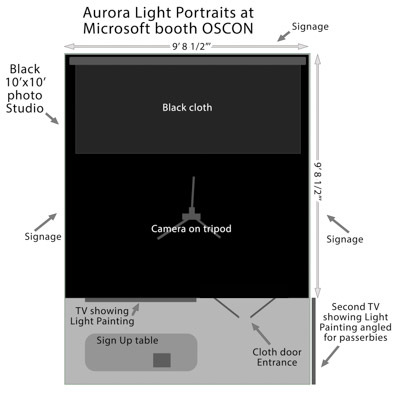 I travel with a black canopy tent: At conventions, we commonly set up a 10' x 10' canopy tent that is dark on the inside. A room can be ideal: If there is a room at an event which can be made dark, that's often ideal. I have many years of experience making a room dark. HDMI Feeds to TVs or projectors: HDMI feed's can go to multiple projection screens or TV screens. In other words, everyone at the event can enjoy the light painting. People can see the images get created: As a light painting image is being created, people can see it coming into existence on the screen! A real time slide-show: There's also a slide-show of all the images taken so far at the event. We can post them right away: There are options with social media, including options where images are posted right away. Facebook, Instagram, Twitter, etc. Watermark the images: Images can be watermarked as you wish. Full res images to attendees: If you with, attendees will get full resolution watermark free images, along with the rights to use those images however they desire. 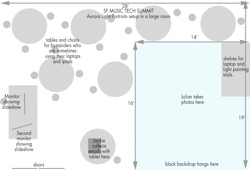 For example, at the SF Music Tech Summit, our employers wanted the musicians who were photographed to be able to use their images for self-promotion of any type. An online web gallery: The images will be posted to an online web gallery, if you want one. Images on Facebook: The best images are usually put on my Facebook page. Images can be watermarked with the branding for the event. For example, in the lower right corner of this image is a watermark. Everybody is then encouraged to "tag" their photos. Often, people change their Facebook profile picture to be one from the event. We email everybody their photo: At the event, we take the time to collect e-mail addresses from all participants. If desired, we can email everybody there photo. Some parties have a particular theme. 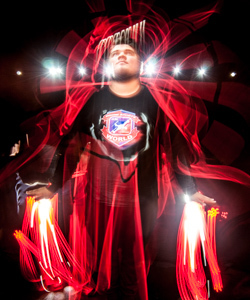 Julian is happy to work with your creative team to make the light painting portraits that are perfect for your event. These can include branding/logos. The subjects can be holding your product. Maybe you want specific visuals or color. The medium is incredibly versatile and you will get what you want. We are great to work with, professional, and reliable. You will get a quote very quickly. The city. Julian is based in the San Francisco bay area. 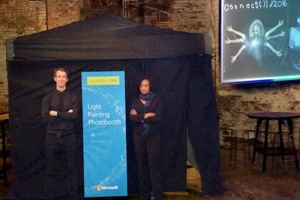 Would you want to use the canopy tent, a dark room, or just a dimly lit party? If you're not sure, we can figure that out quickly. Will there be a projection screen or TV? You will be provided with a price quote quickly.